The alternative learning system is a depEd program for those who have stopped schooling and would like to reenter school. The department has created an accreditation and equivalency program for them. Any former dropout who pass accreditation test is mainstreamed into the educational system. The ALS reviewer, elementary level provides a solid makeup study system to make good in the accreditation and equivalency test of the deped. The ALS reviewer, secondary level provides a solid makeup study system to make good in the accreditation and equivalency test of the deped. Saint Mary’s Reviewer is developed within the content areas of Mathematics, Reading, Language, Science, Heograpiya, Kasaysayan at Sibika, Pagbasa and Wika. 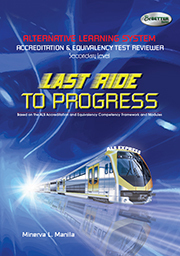 The material consists of a comprehensive practice tests and mock test for each learning area. 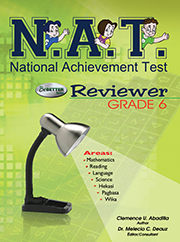 The practice tests and mock tests introduce the students to the format and content of National Achievement Test given by the Department of Education. Using Saint Mary’s Reviewer helps the learners master skills, content, and test-tasking strategies. President Benigno S. Aquino III is determined to institute reforms in our government including the education sector. To give impetus to his ten-point agenda in Education, it is therefore necessary to have a rigid system of selecting education leaders who could effectively and efﬁciently manage and run our public school. Any project or program in education implemented nationwide will not be successful without direct participation and leadership from the school principals. Since 2008, when the DepEd started to administer the National Qualifying Examination for School Heads (NQESH) through the NEAP, it has shown that majority of those who took the test failed. 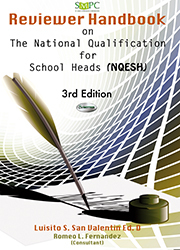 In the last two years of the NQESH, only less than (10) percent passed. 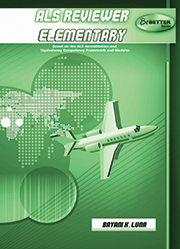 It is therefore the main motive of the writers of this reviewer handbook to help candidates pass the said examination. This third edition includes the most important and recent programs of the DepEd: the K+12 BEC, Republic Act No.10157, Mother Tongue Based-Multi- Lingual Education (MTB-MLE), ACCESS: (A Child and Community–Centered Education System), strengthening the Practice of SBM, and DepEd Order No.40 s.2012 (DepEd Child Protection Policy). The Editor wishes therefore to give the users of this review material the opportunity to become Principals – the Pillars of Philippine Education.